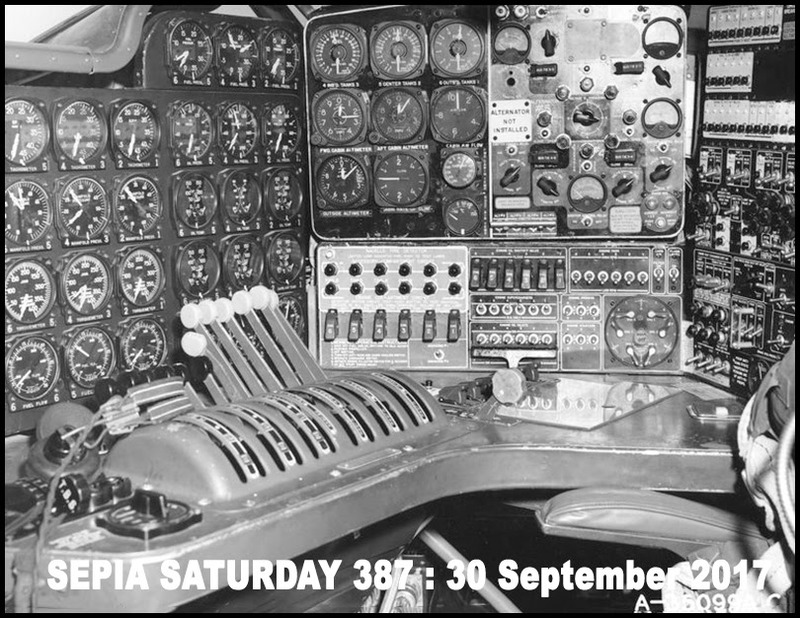 Our Sepia Saturday theme image this week features the cockpit of a 1948 B-36 plane. 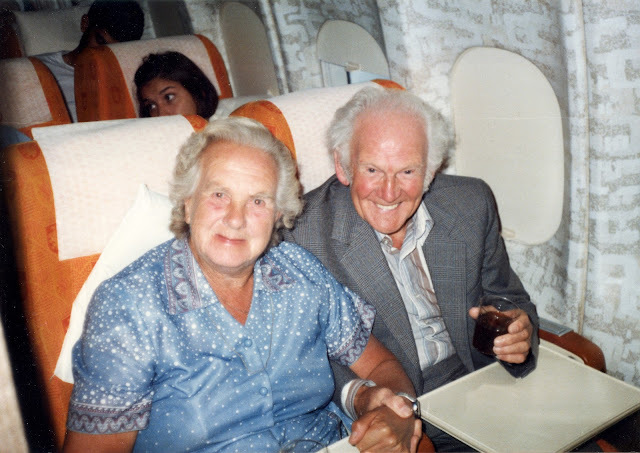 As soon as I saw it, I thought of a photograph of my mother and father taken on the flight deck of a commercial aeroplane on the occasion of their Golden Wedding in 1985. This, of course, was back in the days when people would be invited up to sit in the captain's seat and there was a far more relaxed attitude to airline security. 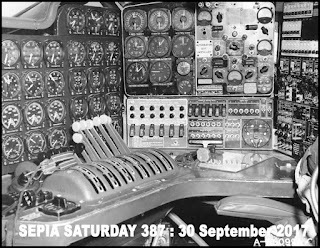 I have spent a couple of hours this morning searching for the photograph, but to no avail - it is in a box, or a folder, or a cabinet somewhere, but my system of storing and filing the thousands of old photos in my collection is about as complex as the B-36 flight-deck, and, I suspect, nothing like as organised. 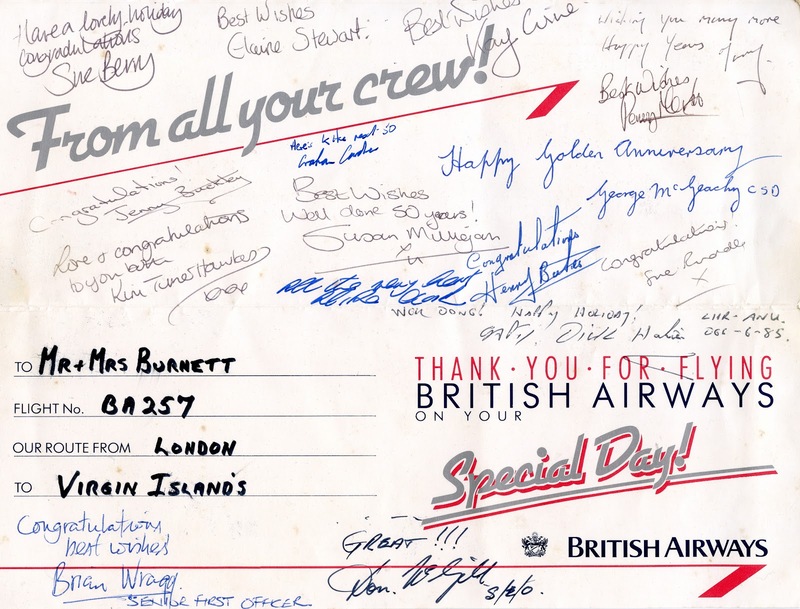 I did however find another photograph of my parents from the same journey and the card they were presented with by the Captain and crew. 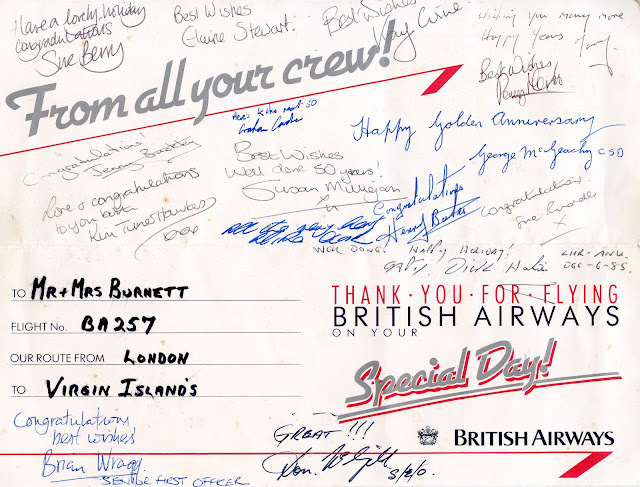 As you can see, they were flying from London to the British Virgin Islands (they were on their way to visit my brother and his family), and this gives the photograph a certain topical interest in the weeks that follow the devastation brought about by Hurricane Irma. I know they had a wonderful time on those beautiful islands, and although times are very hard there at the moment, with the hard work and dedication of the residents of the BVI and the other islands affected by this dreadful hurricane season, I am sure there will be wonderful times to look forward to again in the future. To follow other flights of fancy, go to the Sepia Saturday Blog and follow the links. It is funny how some phrases can sneak up on you and become part of the stock of your vocabulary without you realising it. Take "double whammy": the dictionaries can quite clearly trace the development of the phrase in the 1940s and 1950s in the USA, but they can't identify exactly when it crept into the understanding of a old, fat bloke in Yorkshire who has never seen a baseball game or read the Li'l Abner comic strip. Now, however, the phrase is a part of my everyday life and perfectly meets my needs when describing certain situations. 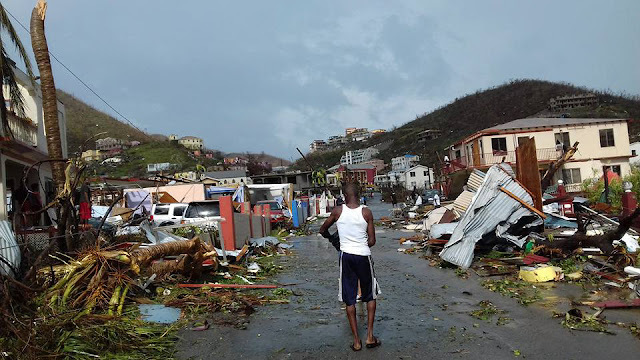 Half my immediate family live in the British Virgin Islands, and a couple of weeks ago I wrote about my concern for their safety following hurricane Irma, and the longer-term impact on the wonderful islands they call home. Most of the rest of my closest family live on the Caribbean island of Dominica, and what I didn't realise when I wrote that earlier post was that hurricane Maria was about to do to that island what Irma did to the BVI. Many of you will know my brother Roger from the frequent comments he leaves on this blog, and for six days there was no news of his, and his family's, safety following a direct hit by Maria. I only learned of his safety on Sunday, and although he is safe, the island has suffered almost unimaginable damage. Just like baseball and Li'l Abner, I have no experience at all of the terrible destructive power of hurricanes (in these parts we call it a strong wind if it can blow a bit of soot out of an old mill chimney). What I do know, however, is that if we sit back and forget about the ongoing plight of all those people who have been affected by Harvey and Irma and Maria, if we imagine that now the winds have stilled life can immediately go back to normal, then we will be translating a double whammy into a triple whammy. These days any organisation worth its weight in bureaucracy has its own website. Whether it manufactures wheelbarrows or prize marrows, whether it collects statistics or rubbish; there will be a website somewhere which provides details of everything it does. If the website is not for a commercial organisation, it will often be funded by advertisers, who will hope to generate business for their products from people who visit the site. A century or more ago, such information was provided by local handbooks, guides and trade directories, and these too would often be supported by advertisements from local companies. 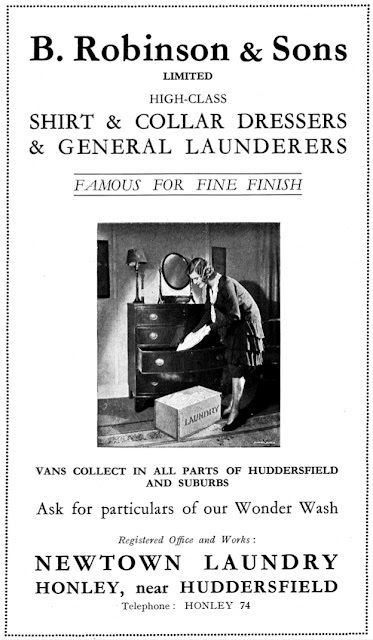 These illustration are from "Huddersfield - The Official Handbook", which was published in 1930. 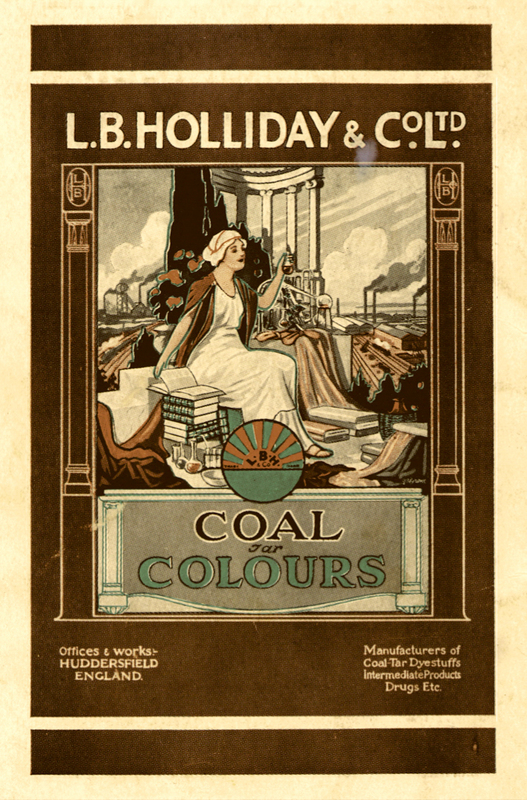 As the wonderful colour advert for the local dye company, L.B. Holliday, clearly shows, this was still the golden age of advertising, when copywriters were able to combine product information with artistic style. At one time, L.B. Holliday & Co was the largest privately owned dye manufacturer in the world, but the company of that name faded away in the 1990s. 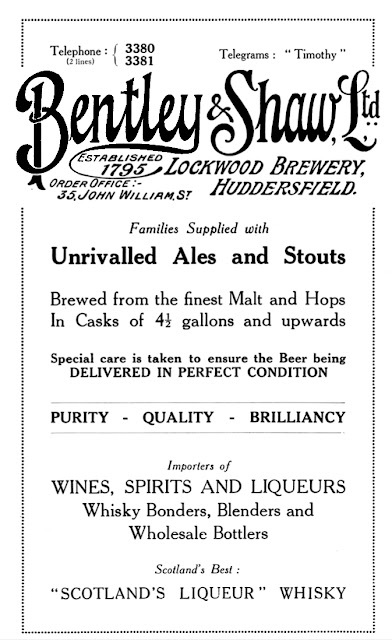 Even without full colour and pre-Raphaelite imagery, the adverts could still be attractive, even if it was simply by virtue of the typography - as illustrated in the advert for the brewers, Bentley and Shaw. 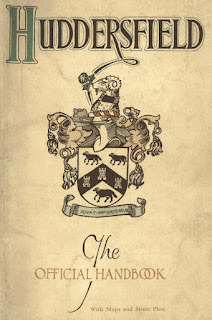 That particular company had been established in the Huddersfield area by the end of the eighteenth century, and continued brewing until the early 1960s when its purity, quality and brilliancy finally went flat. And who could resist this final advert for the Newtown Laundry, which - it seems - was famous for fine finish. 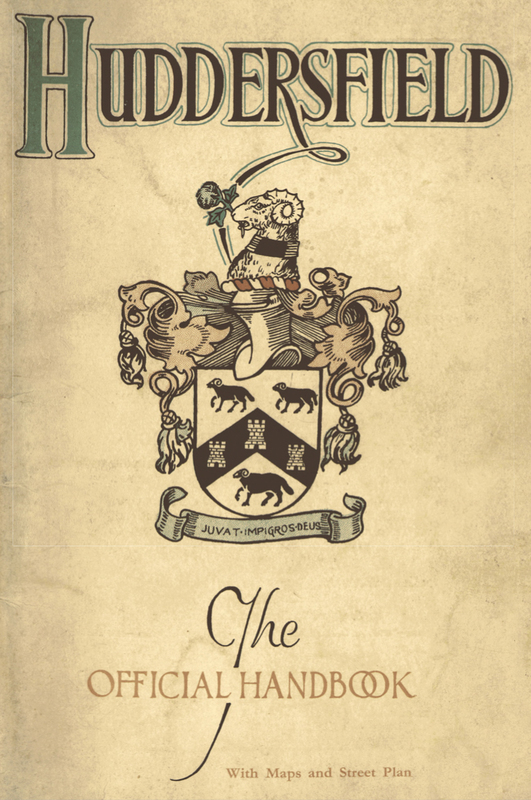 Alas it is no more, as all traces of the firm have vanished like the grime from a freshly laundered shirt collar. As some of you will know, many of my closest relatives live on the British Virgin Islands. You will therefore understand that the last few days have been a period of intense worry about their safety and well being. We lost contact with them last Wednesday morning and they didn't manage to get a message out of the island until late yesterday (Saturday). 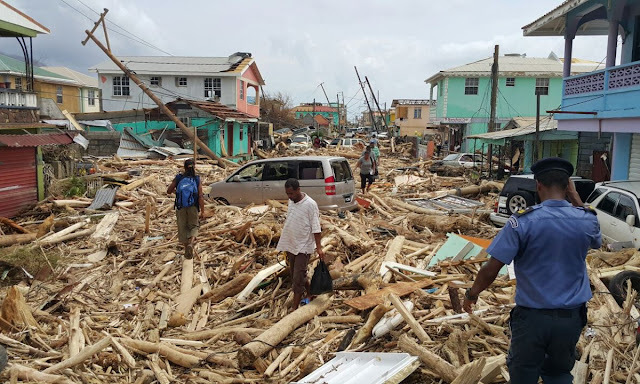 The good news is that they are all safe: however, like most of the other residents of the islands, they face an immediate future where their homes and businesses have been devastated. Although aid is beginning to arrive, the challenge of rebuilding the basic infrastructure of the island is going to be massive. Hurricanes move on - and our thoughts are now with the people of Florida who are currently facing the wrath of Irma - but the destruction they cause last for a very long time. Our help, support and solidarity will be needed long after the storms have calmed. I have no idea who this child is - but he (or maybe she) is standing around at the door of a house and is therefore perfect for this series. The photograph comes from that very large box of old photographs marked "unknown", but it is no less wonderful for its lack of provenance. Indeed it is a particularly fine photograph, the detail caught by the lens a century or more ago is as good as any modern-day digital SLR. It also shares that other common element of many of these "standing around" photographs - the sense of freedom that accompanies an escape from the confines of a photographers' studio. There is no brace holding this child's back straight, no photographers' assistant carefully composing a bit of a pose. 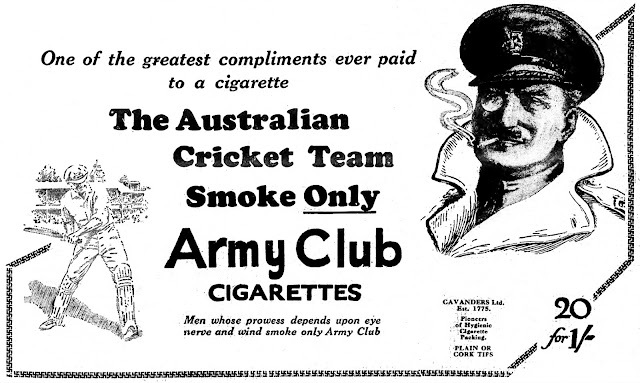 Was there ever a finer advertising slogan composed than "Men whose prowess depends upon eye nerve and wind smoke only Army Club". It will come as no surprise that Australia suffered defeat in the 1926 cricket tour of England. 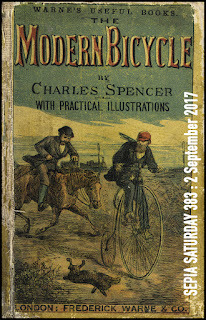 Our Sepia Saturday theme image this week features the front cover illustration of a book entitled "The Modern Bicycle". 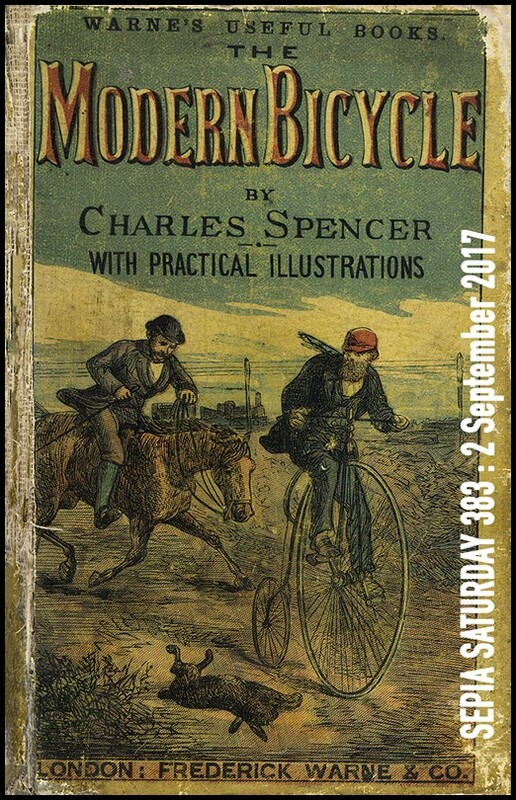 I seem to be all out of bike photographs for the moment, so my imagination was grabbed by the idea of book cover illustrations. 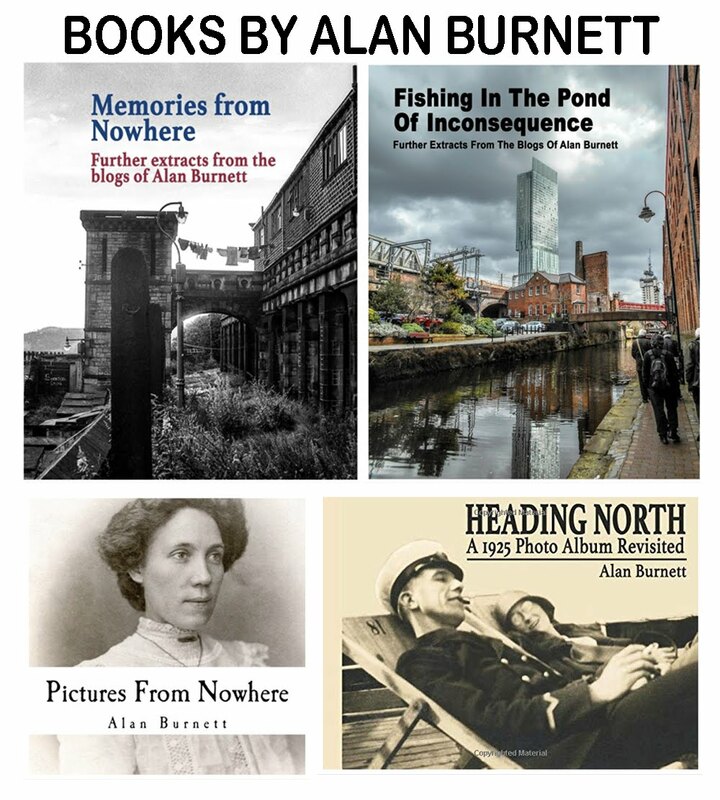 I could happily spend my life designing covers for books I will never write. As an example, I would like to present you with that soon-not-to-be-published bestseller "From Mac With Love", by none other than my good self. The title comes from a small sepia photograph that came to be from the collection of my Aunt and Uncle, Annie (also known as Peggy) and Harry Moore. The subject of the photograph is not them, but a contemporary couple confidently striding out on some inter-war seaside pier. 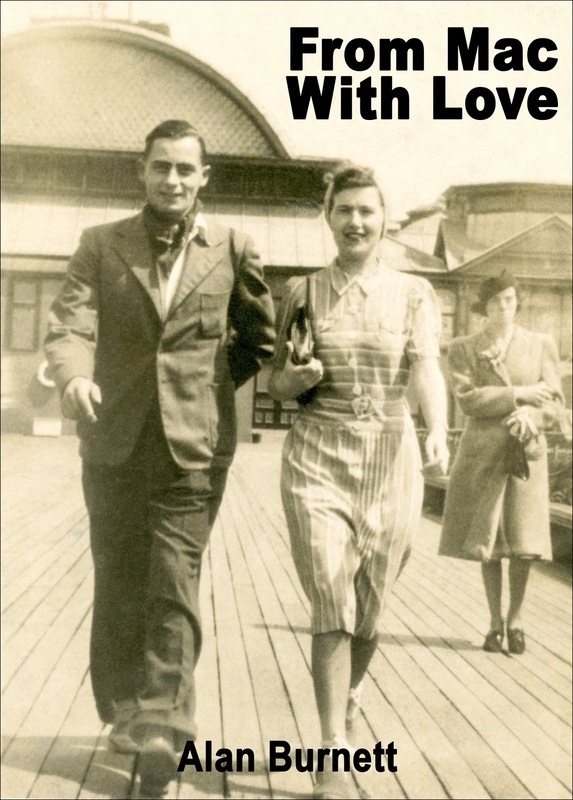 On the back of the photograph has been pencilled "To Harry and Peggy from Mac with love". 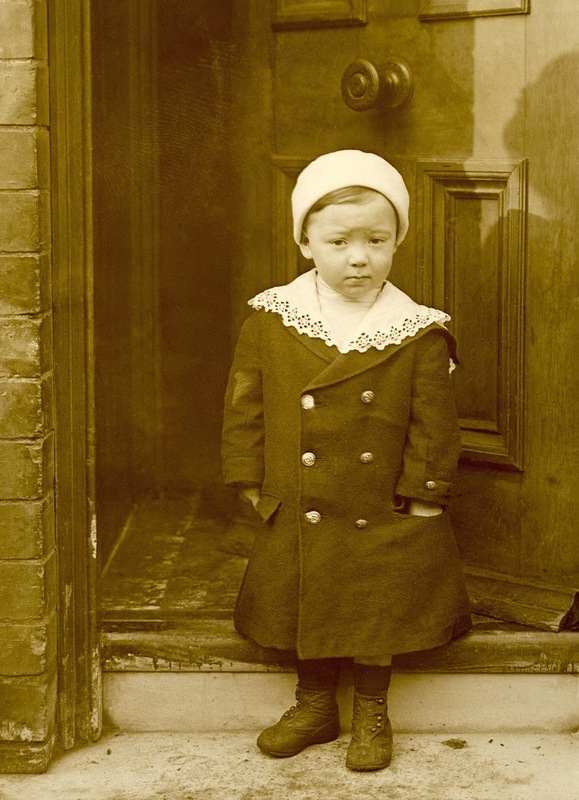 The book itself tells the story of Donald and Joan McEwen and traces the interaction between their lives and relationship and the economic and social history of the 1930s in Britain. As the story develops we witness the way in which the confidence of youth gives way to disillusionment, separation, and eventually, tragedy. If that sounds worth reading it just goes to show that you can never judge a book by its cover. You can open up a volume of sepia stories by going to the Sepia Saturday Blog and following the links.